Today’s card refers to Universal justice and righteousness. Truth. Awareness. Objectivity. Honesty and Integrity. As Mercury moves into Libra this morning, these are the concepts we’ll see seeping into the collective unconscious. You may be weighing different options or thinking about how to bring the divergent areas of your life into balance. Or you may be dealing with a situation that calls for you to rise above your personal preferences in order to arrive at what is fair and just. In this version of the card, we see repeated themes of balance and symmetry. 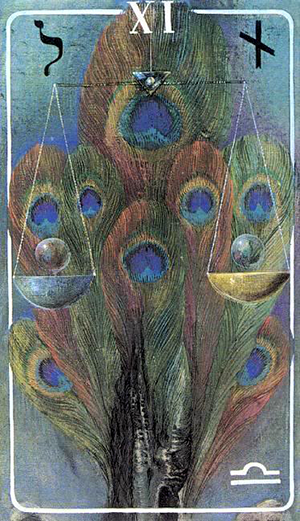 The scales suspended from an invisible thread, the peacock feathers in the background, and the esoteric symbols on the corners of the card. The peacock feathers are symbols of truth and integrity. As animal totems they signify watchfulness, protection, guidance and nobility. The scales are made of silver and gold — opposing elements — each containing a translucent orb that floats slightly above it. A sudden gust of wind or ruffling of the peacock feathers could upset the whole contraption. This is an important feature of this card. It reminds us how precarious the concept of Justice truly is, and how important it is to keep things in balance. The Hebrew symbol “Lamed” is in the upper left corner, the Norse rune “Naud” in the upper right, and the astrological glyph for Libra is in the lower right. Lamed is said to refer to wisdom, learning and action. Naud is tied to self-control, deprivation and sacrifice. And the Libra glyph speaks of balance, cooperation and harmony. Together these symbols describe the principles related to law and Justice. This card refers to Universal or Cosmic Justice — right vs. wrong rather than what you might desperately hope for or want to happen. Sometimes it refers to justice in the legal sense. And sometimes it has to do with a situation that may seem unfair to you specifically — especially if you’re personally invested in the outcome. The card used for today’s tarotscope — Justice — is from the Haindl tarot, created by the late Hermann Haindl with the companion book written by Rachel Pollack . This deck was published by U.S. Games.